"An unusual combination I came up with one night while preparing my lunch for the next day. Was scared to try it, but it turned out to be good! You could replace any ingredient to make it your own." 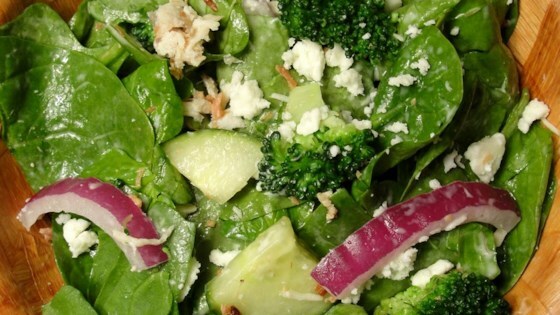 Toss together spinach, cucumber, broccoli, feta, onion, chicken, and bacon in a large bowl. Pour dressing over salad, and gently toss again. I love this type of salad. For tose who don't like raw broccoli, just blanche it in a couple cups of steaming water for about 15 seconds until it changes to a bright green color. Much tastier! I didn't measure anything and it turned out great. I will make it again. My family thought this Spinach Salad was one of the best they had tasted. I left the chicken out as I used it as a side dish with chicken on the grill.